We have had a nice busy week so far. Things have been running pretty smoothly on our end. I would say that changing my mom’s medications around has gone well so far. We have been dealing with a lot less anxiety & seeing a lot more smiles. It has made getting out of the house a much more pleasant experience. Hopefully we are only going up from here. My mom is still feeling “sensations” in her skin. She at different times feels the sensations of magnets, tacks, coins and worries about cutting a membrane. I am still not even sure what that means. She knows that it is not possible to have these things under her skin….and usually lets the topic go rather than getting upset. I think that we are just coming to accept that these feelings might be here to stay…but we will still pray that they go away! Monday we went to see Bridesmaids with my mom’s bestie Amy. It was such a nice day out that we felt a little guilty seeing a movie, but heard it was really good. The reviews were right! I just loved seeing my mom laughing and smiling away. I think we would all highly recommend it! Yesterday was full of visitors. From the moment we woke up (which wasn’t until 10:00 hehe) we had our nurse Veronica come over for her weekly visit. Then my Godmother Mary came over, followed by Catey (who helps us out), my cousin Lindsay & her baby Sylvia, then my uncle (Lindsay’s dad & my mom’s twin brother) stopped by. My mom loved all of the company. People & visits give her fuel and energy. My cousin Lindsay also gave my mom a much-needed haircut. We usually head over to her salon…but Lindsay offered to do it at home this time. We creatively managed to get it cut while my mom was in bed and it looks great. Thanks Lindsay! 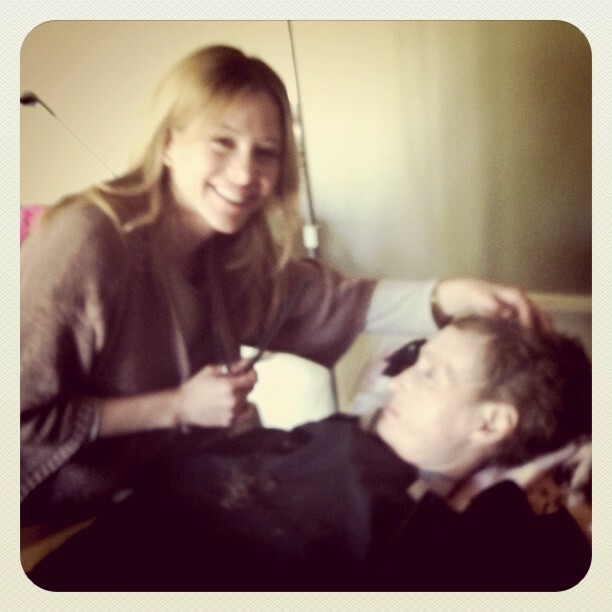 My cousin LIndsay trying to give my mom a haircut in bed. She can do anything! Last night Jenna came over to give me the night off. We grilled dinner and ate as a family (which was very nice) and then I ran some errands for myself. Our dad is heading to Michigan to visit his dad for a long weekend, so it will just be the ladies this weekend. He is taking my Saturn (which has over 180,000 miles on it) so we appreciate prayers for a safe drive! It is a great car…and does great on the gas mileage….you just never know. And that brings us to today. 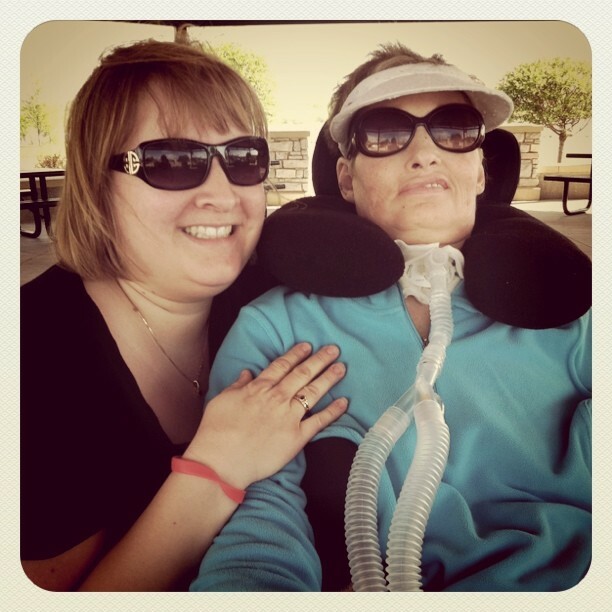 The weather is GORGEOUS….so we went for a walk at the pond area with Jenna. Jenna practiced her wheelchair driving skills to give me a little break. It isn’t as easy as you think to get a good consistent speed. Jenna makes me laugh and laugh when she is driving the thing. She is getting better though! Mom and I after our walk. My smile looks strange...but I love my moms! And that is all for today! Thank you for checking in! Prayer for Roger: Pray for a safe journey to Michigan this weekend.